We Offer Eye Care Services in Ajax, including Eye Exams! 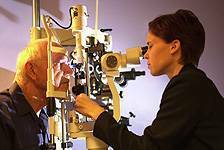 The eye care professionals at Ajax Family Eye Care give thorough eye care to a diverse clientele with specialist support for a wide array of issues such as macular degeneration, dry eye, diabetic retinopathy, glaucoma, and cataracts. 80% of learning is visual, which means that if your child is having difficulty seeing clearly, their learning can be affected. Ensure that your children have the visual resources they need to grow and develop normally with an eye exam. As we reach middle age the lens of our eye becomes increasingly inflexible, making it harder to focus on close objects. This condition is called presbyopia and eventually it happens to everyone to some extent.